The description of the annual agricultural fair in Richmond Hill. RICHMOND HILL ANNUAL AGRICULTURAL PAIR. This has been an annual event of great interest since 1849, when the first fair was held. May 24th, Victoria day was the date for many years but now it is held on the Monday nearest to that date which is the official holiday. Through the years it has been a meeting place where friendships were renewed, many native sons and daughters returning to the "Old Home Town" on Fair Day. 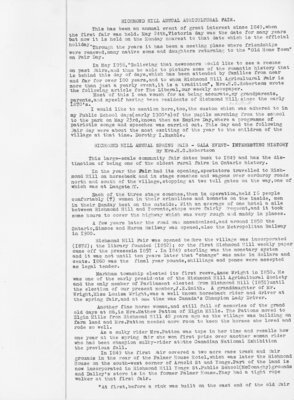 In May 1956, "Believing that newcomers would like to see a resume on past fairs, and thus be able to picture some of the romantic history that is behind this day of days,which has been attended by families from near and far for over 100 years, and to whom Richmond Hill Agricultural pair is more than just a yearly event, it is a tradition”, Mrs. H.G. Robertson wrote the following article for The Liberal,our weekly newspaper. Most of this I can vouch for as being accurate, my grandparents, parents, and myself having been residents of Richmond Hill since the early 1870's. I would like to mention here, too, the custom which was adhered to in my Public School days (early 1900's) of the pupils marching from the school to the park on May 23rd, known then as Empire Day, where a programme of patriotic songs and speeches was carried out. This day and the following Fair day were about the most exciting of the year to the children of the village at that time. Dorothy I. Rumble. This large-scale community fair dates back to 1849 and has the distinction of being one of the oldest rural fairs in Ontario history. In the year the Pain had its opening, spectators travelled to Richmond Hill on horseback and in stage coaches and wagons over corduroy roads north and south of the village, stopping at two toll gates on the way, one of which was at Langstaff. Each of the three stage coaches, then in operation, held 16 people comfortably (?) women in their crinolines and bonnets on the inside, men in their Sunday best on the outside. With an average of one hotel a mile between Richmond Hill and Toronto, stops were fairly Sequent, and it took some hours to cover the highway which was very rough and muddy in places. A few years later the road was macademized, and around 1850 the Ontario, Simcoe and Huron Railway was opened, also the Metropolitan Railway in 1900. Richmond Hill Pair was opened before the village was incorporated (1872); the library founded (1852); or the first Richmond Hill weekly paper came off the presses in 1857. In 1849 sterling was the monetary system and it was not until ten years later that "change" was made in dollars and cents. 1860 was the final year pounds,shillings and pence were accepted as legal tender. Markham township elected its first reeve, Amos Wright in 1850. He was one of the early presidents of the Richmond Hill Agricultural Society and the only member of Parliament elected from Richmond Hill (1851) until the election of our present member, J.E. Smith. A granddaughter of Mr. Wright, Miss Louisa Wright, was a well known horseback rider and driver at the spring fair, and at one time was Canada's Champion Lady Driver. Another fine horse woman, and still full of memories of the grand old days at 86, is Mrs. Mathew Patton of Elgin Mills. The Pattons moved to Elgin Mills from Richmond Hill 40 years ago as the village was building on farm land and Mrs. Patton needed more room to keep the horses she loved and rode so well. As a sulky rider Mrs. Patton was tops in her time and recalls how one year at the spring fair she won first prize over another woman rider who had been champion sulky-rider at the Canadian National Exhibition the previous fall. In 1849 the first air covered a two acre race track and fair grounds in the rear of the Palmer House Hotel, which was later the Richmond House on the south-west corner of Arnold St. and Yonge. Part of the land is now incorporated in Richmond Hill Yonge St. Public School (McConaghy) grounds and Dailey's store is in the former Palmer House. They had a tight rope walker at that first fair. "At first, before a rink was built on the east end of the old fair grounds" on one of the oldest residents and a member of the Board of Directors recalls, "everything was exhibited in the open air. Cattle were tied to fences sheep and hogs were in pens, and poultry shown in crates". "No guarding fences surrounded the horse rings - strange to say, so far as I remember, no one was ever hurt by a horse". Richmond Hill boasted five hotels, a blacksmith shop situated just about where Clarke's Drugostore now stands, and two carriage factories among other places of business in those days. It must have been a fine sight to see the horse driven carriages, shiny and spanking clean, as they wheeled around the course at the lair's Horse Show Richmond Hill carriage makers were fully justified in their pride of workmanship, for they took several medals at the Toronto Exhibition for the fine est display of carriages in the late 1800's. There was no such thing as a public address system in those early year but a horseman with a stentorian voice rode astride a finely bred, high stepping horse, going from hotel to hotel announcing the events as they came on the programme. No doubt the male "spectators " were passing the time between events in cooling refreshment, though it was quite within the law at that time for liquor to be sold right on the fair grounds. Hotels and stables were taxed to their capacity by visitors and their horses. Hotel dining rooms were crowded to the utmost and in 1880 the local churches began serving meals to accommodate the huge crowds who came from as I far west as London, Ontario and as far east as Quebec and New Brunswick, as well as surrounding rural areas. Sometime after the year 1872, Richmond Hill received its share of the Municipal Loan stand from the Ontario government, and history records show that the interest accruing from the same was used to provide "an excellent set of appliances for fire protection and a beautiful lot for Park purposes". This was when the present Municipal Park on the east side of the village was purchased. Lome Avenue came into being at that time and was officially opened to provide access to the park from Yonge Street. In the new park a grandstand was erected close to the north fence. Sewing and fancy work,the same articles tis rumored being shown year after; year at the fair, in the latter part of the 1800's - the same exhibitors winning prizes over and over again each year for the same exhibits. However it is said that a heavy rainfall deluged the fancy work table during one early fair and put an end to these much exhibited "exhibits". The first Agricultural Hall was raised in December 1889, and the hall boasted 50 windows. Community women served meals to as many as 350 people at one sitting in this grand hall. Later, in 1920 the "New Arena" was built. The town jail, built of yellow brick, stood just inside and to the south of the present park gates. However it has no "criminal" history, for most of those who inhabited the jail were transients who were given a meal and a place to sleep, be fore being sent on their way out of Richmnod Hill. To-day we have colourful groups of square-dancers and ballroom dancing at the Pair, but in years gone by the Richmond Hill Village Band, conducted by A.J.Hume (who was also clerk-treasurer) tor the municipality was a very popular part of the fair. It was some years before a Midway was incorporated into Fair Day, and the advent of the first Merry-Go-Round, complete with brass ring, was a red letter day for the children attending the big show. Polo games of byegone years were replaced by "Hunters and Jumpers" and to-day's thrilling Tractor Driving Contests; Cowboy roundups with Palominos carrying their riders bedecked in official "cowboy" gear, make up for the Horse Racing which fifty years ago was part of the day's fun. But nothing has nor ever will take the place of the ponies, carriage horses and roadsters which are still a big part of the program, along with the gigantic and majestic Clydesdales, Belgians and Percherons, whose owners will be seeking trophies in the annual competition s this year as in almost every other year since the fair opened. It would be nice to see a revival of women's interests at the fair This is not to imply that women are not just as interested as men in the horse show, but women do love to display their homemaking skills, and it might be a good addition to this rural event. In 1917 the Richmond Hill Women's Institute had two members on the board of directors for the annual fair. These ladies revised the prize lists and took charge of the fine arts and women's work. Mrs. Margaret Burton, secretary-treasurer, is the only woman on the board of directors. Speaking of prizes. That's another thing that shows how times have changed. Prize money used to ran as high as fifty cents.But of course sugar sold for less than five cents a pound at that time and the best canned salmon brought ten or twelve cents a tin. One hundred and seven years ago the fair was an overnight affair, fifty years ago it was an all day outing; twenty-five years ago some still came in horse drawn vehicles but most came via the radial or by car in the early morning, went home in the late afternoon to do chores and often came back for the late evening closing. To-day judging starts around 11 a.m. and there is something going on all day long so you hate to miss a thing. Attendance in 1854 is recorded at 2,000 men, women and children. 1949 which was Centennial year for the Fair saw 9,000 people pass through the entrance gates. It is remarkable that the weatherman has been so good to fairgoers through the years, except for one year when it snowed, and four or five other years when it is recorded rain fell part of the day, but cleared later. In 1943, the 94th year of the Fair, the people of Richmond Hill celebrated the first fine day of that spring by going to the Fair. It was a cold, wet, late spring. Let's hope this poor spring of 1956 will take a turn for the better in time for this year's show. But just remember when you go to the fair on Monday, May 2l, look past the ferries wheel and the games of chance: the floss candy and the snack bars-all of which we know help to make a day at the fair, get right out by the show ring early. You'll find bleachers there, which were erected by municipal council and public subscription in Coronation year, and the show is carried on right out in the open under the wide blue sky. And, when you smell the tanbark and hear the pound of the horse's hoofs, and listen to the sound of applause from the spectators for a nicely executed jump, remember... this is history, this is pageant,this is friendly competition. This is really the joy and breath of rural living. Officers of The Richmond Hill Agriculture Society for 1956 - Honorary Pres., J.S. McNair; Pres. B. Weldrick; 1st vice-pres. G.Atkinson; 2nd vice-pres. N.Tyndall; sec.-treas., Mrs. M.Burton; Hon. directors, C.Webster, C.L.Burton, J.Fraser, J.E. Smith M.P., Maj. A. MacKenzie, M.L.A. Wm. Neal, C.F.W. Burns, H.A. MacLean, G.Heintzman, W.J.Taylor, M.McMurchy, F.McMahon, A. LeMasurier, I.Stone, Col. R.H.Paterson. Directors - P.С. Hill, M.Boyle, C.Henshaw, A.Bagg, M.Savage, G.Rumney, L.Beatty, W.Clark, F.Pratt. Associate directors - P.Perkins, A.Stong, R.Cooper, P.Bovaird, R.Endean, E.Redelmeir, H.McCague, P.Webb, R.Holling-sworth, H.Mackie. Past Presidents - J.S. McNair, T.Trench, O.D.Robinson, H.Charles, F.S. Tyndall, R.W.Scott, W.Middleton, D.Rumney, S.Rumble. Hon. Physician - Dr. J.P.Wilson. Hon. veterinarians - Dr. Geo. Kelly, Dr. W.A.Ripley, Dr. T.K.Darlington.